A sailboat is caught on the rocks near a small village on the Spanish coast. When one of the holidaymakers onboard is injured and trapped, rich investor Paul (Ezra Godden) and his girlfriend Barbara (Raquel Meroño) head ashore to find help. They discover the town streets all-but-deserted, and a local priest with something terrible to hide. Then Paul and Barbara are separated, and for Paul the village transforms into a perilous nightmare without her. This is not, as it happens, a synopsis of H.P. Lovecraft’s noted 1919 short horror story “Dagon”. Instead this 2001 film adapts a more popular Lovecraft work: the 1931 novella “The Shadow Over Innsmouth”. Someone somewhere up the executive chain clearly felt Dagon was the snappier title of the two and changed it appropriately. In keeping with its Spanish millennial setting, Innsmouth becomes Imboca and its protagonist shifts from being a student to becoming a rich Wall Street investor instead. The result is an enthralling and atmospheric knock-out: a claustrophobic thriller whose production restraints actually enhance rather than degrade its suspenseful sense of tension. It is the best kind of cult film. That is not entirely a surprise. 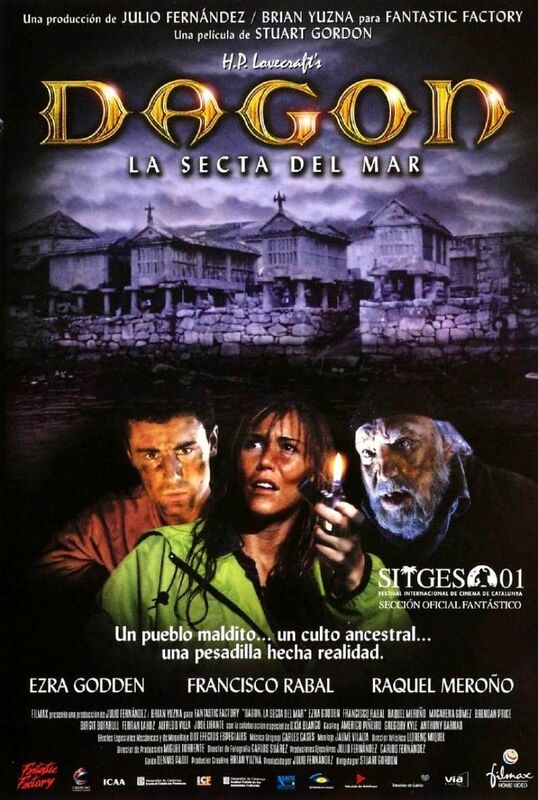 Dagon comes via Stuart Gordon, whose screenplays sparked off studio blockbusters like Honey, I Shrunk the Kids and whose directorial works include cult hits like Re-Animator and From Beyond. The budget may be limited, and the cast are perhaps a little underwhelming, but altogether Gordon delivers a film that is thrilling, tightly wound, and wonderfully atmospheric. Fans of old-fashioned screen horror will find plenty here to enjoy. Anybody seeking something more violent or contemporary may be surprised at how effective Dagon really is. There’s something specifically frightening about how the film plays out. It essentially never leaves Paul’s side as he sneaks, runs, and hides his way through the streets of Imboca. That makes the film feel very personal and intimate, and not to mention claustrophobic as well. It is never immediately obvious how Paul is going to escape or survive, and it is a regular experience to think of his situation as hopeless. The suspense simply ratchets up progressively as he approaches the centre of Imboca’s unearthly population, and finally confronts the evil force that has taken over the town. This is not an overly inventive horror story, but it is an effectively told one. It is a perfect little nightmare for viewers. Ezra Godden is solid but unexceptional as Paul. He benefits from the character being deliberately styled as a sort of generic ‘everyperson’. The supporting cast, including Raquel Meroño as Barbara and Francisco Rabal as the homeless survivor Ezequiel, is a step more accomplished, however the film still presents a stronger focus on writing and aesthetic than on character. The visual effects and production design are limited by Hollywood standards, yet are presented with thought and integrity. It helps to paper over any production deficiencies and keep everything focused on what is clearly the most important: telling a suspenseful and effective horror story. In that regard Stuart Gordon has done an excellent job. This is a superb late-night horror movie, aimed directly at its home crowd. Gordon knows what his audience wants, and time and again he proves a deft hand at giving it to them.